Alsatian Or German Shepherd Dog - What Is The Difference? Alsatian and a German Shepherd Dog? Alsatian? German Shepherd Dog? GSD? Deustcher Schaferhund? What is the true difference between an Alsatian and a German Shepherd Dog, if any? Let me assure you that there is no difference. In fact, all those names above refer to the same dog breed - the German Shepherd dog. After both World Wars, I and II, anything associated with the name "German" fell out of popularity and people openly did everything possible to disassociate themselves with the name and country too. So, to avoid the use of the word German in the name for the German Shepherd Dog breed, many countries and kennel clubs changed the name of this dog breed to get rid of the negative German association. And to my knowledge, there is no other dog breed that has this same kind of name changing history included in their background. So, here's what happened next in the whole GSD name changing saga. Around 1917 or so the American Kennel Club changed the name of the German Shepherd Dog breed to the "Shepherd Dog". Additionally, the members of the German Shepherd Dog Club of America also changed their name to the "Shepherd Dog Club of America". In England, Ireland and many other European countries the name of the GSD breed was also changed to the name "Alsatian" (from the Alsace-Lorraine area). In many European countries especially, this name stuck, and old German Shepherds there are still known by this name even today. 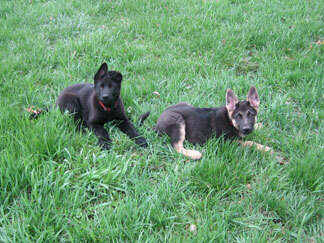 The original name for this dog breed in Germany is Deustcher Schaferhund which literally means "German Shepherd Dog". It is also interesting to note that the word "Dog" is actually part of the name of the GSD dog breed. Other commonly used names for the German Shepherd Dog are GSD, German Shepherd and Alsatian Wolf Dog. So, don't get confused - especially if you're traveling abroad or speaking with people from other countries about these dogs. All these names apply to the same dog breed, the German Shepherd Dog. So, if you're interested in an Alsatian puppy, or a German Shepherd puppy, it doesn't matter which you get - just remember that they're one in the same dog breed.